Round Star Foundation works to improve the lives of people of all ages by providing access to high quality soccer activities, training and education. We believe that soccer is an invaluable tool not only for physical development, but for social inclusion, engagement, and a powerful mechanism for strengthening communities. With this in mind, the Round Star Foundation contains three tiers of initiatives to help children of all different ages, backgrounds, and origins. The first initiative is the Round Star Foundation USA-Brazil Soccer Exchange, the second is our Special Needs Soccer Program and our last initiative is our Scholarship Foundation. Our first initiative is aimed to teach adults in different countries not how to play soccer, but how to teach children and become mentors so one day these children can grow up and become mentors. We have traveled to Zimbabwe and Brazil to implement this ideology of giving back and how important educating children is around the world. Our second initiative aims to help individuals with disabilities develop socially, physically, psychologically, linguistically, cognitively. We currently work with three District 75 schools. Due to the success in these initial schools, we are extending this program to seven other schools at the start of the 2014-2015 school year. With the expansion, we will broaden the programs reach by 700 children. Our last initiative is to provide scholarships for children less fortunate. Providing children with scholarships opens up many opportunities for them that they otherwise might not have had. All three of our initiative are a vital part to our slogan "Making the world a better place through soccer." Below are some pictures and descriptions of our initiatives in Brazil and Zimbabwe. In advance of the 2014 World Cup, a team of 4 Super Soccer Stars coaches traveled to rural Bahia in Brazil at the end of November, 2013. In collaboration with Round Star Foundation, our coaching team worked with a group of at-risk youth to hone soccer skills and teach the students the basic coaching techniques through our T.A.L.E.N.T. program. In addition, we introduced our unique Building Soccer Bridges platform to dozens of local school physical education teachers and provided a donation of soccer equipment for the local school network. Super Soccer Stars partnered with United States-Africa Children’s Fellowship – USACF and Round Star Foundation to bring the joy of soccer to unprivileged children in Africa. 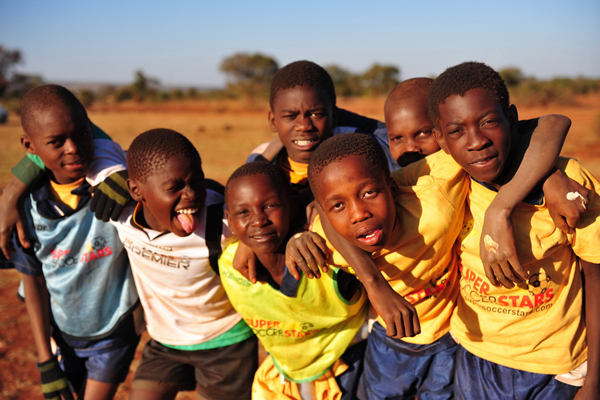 In 2010, 2012, and 2013 teams of Super Soccer Stars coaches led dynamic soccer clinics for hundreds of children and school teachers in rural Zimbabwe and provided donations of soccer equipment for the local community.